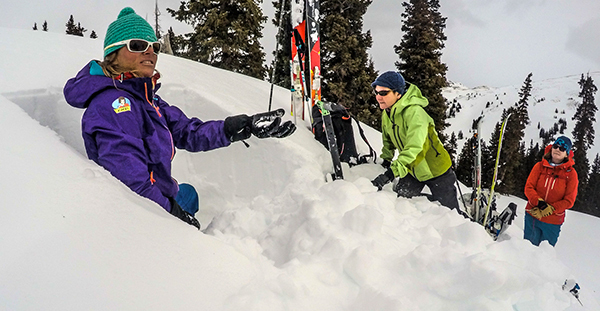 Join our all women’s AIARE Level 2 in conjunction with the Silverton Avalanche School to learn the key elements of making sound decisions while traveling in avalanche terrain from some the most experienced women guides and instructors in the industry. The AIARE Level 2 is now a 3-day program that provides backcountry leaders and aspiring snow professionals the opportunity to advance their avalanche knowledge and decision making skills. The Level 2 builds from the introductory avalanche hazard management model introduced in the Level 1 and adds to it the evaluation of factors critical to stability evaluation. This course is based out of the St Paul Lodge in the beautiful San Juan mountains. Food and accommodation are all inclusive in the fee. Being immersed in the mountains allows for more field time and an intimate interaction with the snow environment. The AIARE 2 is a three-day course for those who have taken an AIARE 1 and Avalanche Rescue and have had at least a year of backcountry travel experience. The AIARE 2 provides backcountry leaders the opportunity to advance their avalanche knowledge and decision making skills. For those who have not taken the Avalanche Rescue Course, the Level 2 certificate will be issued after completion of the 1-day Rescue Course. Participants must have the ability to travel in avalanche terrain via skis or splitboard. An AIARE 1 Course (strongly recommended) or equivalent Level 1 training is required. A winter of practical experience after the Level 1 course is required before taking the AIARE 2 course. Friday, Saturday and most of the day on Sunday will be spent traveling in the backcountry with your instructor to participate in experiential sessions that examine topics discussed in the classroom. Field sessions include multiple burial companion rescue, route finding and safe travel, backcountry stability assessment, full and test pit profiles, fracture line profiles and a snow crystallography lab. These sessions will also be an opportunity for instructors to evaluate where students need the continued study to best support their aspirations. Students receive the Snow, Weather, and Avalanches: Observation Guidelines for Avalanche Programs in the United States 2010 edition AAA, USFS. as a part of the course. Students use the Level II Course Manual and an AIARE field book for the course. We also recommend that students read the Avalanche Handbook (3rd edition) prior to the course. An AIARE Level II Course Certificate is provided at the end of the course. When you click on the REGISTER NOW button for the dates you’re interested in registering for, you will be re-directed to the Silverton Avalanche School website to complete the booking process. Transportation to Red Mountain Pass. (Please see our Travel Logistics page for specific info).